Cross bridge over river from eastern bank and turn left into village. Aire on right within 50mtrs. Marked pitches with EHU included. There is a 8 til Hiut mini market alongside Aire that has a good selection of most food items and a reasonable boulangerie opens from 7am til 7:30pm. Mobile Pizza van comes on Mondays. Attendant supposed to visit each evening to collect fees but we stayed here 3 days and nobody showed. There was a sign on a post saying €6 fees collected in the evenings but free parking during day. Area lit at night and some road noise during day but quiet at night. 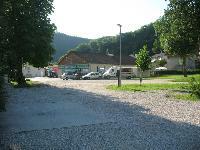 Cost per 24hrs: Not a lot to entertain in this village but handy for a stopover en-route to the Jura region. Reasonable cycle/walking along river.